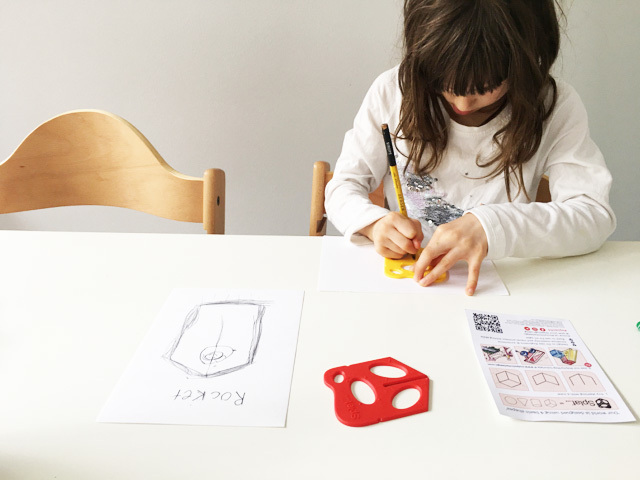 Little Miss and I recently tested out Splat, a 3D Drawing Tool designed by Australian Designers Nuts n Bolts Design and sponsored by Engineers Australia. Splat in old English means to split up and it refers to the centre line of the Splat's design, that splits the product into the left and right side. You can design 4 basic shapes with the tool and design anything you like! The tool is great for STEAM (science, technology, engineering, art and maths) projects at home or at school and is perfect for developing creativity and visual problem solving skills and is easy to use for all ages. After a few reads and demonstrations from the website, little Miss and I started ‘Splatting’ and made different shapes with the tool. It was fairly easy for little Miss to use the tool and make whatever shape she wanted, she was even inspired to draw a rocket from the shape of the Splat! She followed a few examples and managed to do a triangle on top of her cube. So much concentration in this photo as she tried really hard to problem solve the issue of creating a triangle. After adding a few circles on the square and her triangle, little Miss loved colouring her shape in. I on the other hand tried a few different things, I am not the most creative person however I managed to test the tool and see what different shapes I could make with it. Now to get little Mister started on Splat, he did have a go but his drawings need some work. You can access Splat 3D Drawing tutorials on their website (mentioned below). The beauty about Splat is that it’s designed and made in Australia. You can buy your Splat tool for as little as $4.99 on their website and it comes in either red or yellow. For more information or to buy Splat 3D, checkout their website. Busy City Kids asked to test this product to add to our Busy Tech Kids review page and to encourage the use of STEM/STEAM products. This post is in no way sponsored. Products were provided however our opinions are our own and we only endorse businesses or/and products we believe in. Read more in our Disclosure Policy here. For more Busy Tech Kids reviews of apps, products and more, head to our Busy Tech Kids page.